To the South West of Trondheim in Norway lies Melhus, a farming community represented by a football side in the Norwegian Division 3 - roughly equivalent to our own Nationwide Division Three. Bang up to date with a photo of some red hot goal action courtesy of two TAPIBAWS getting it on in the FA Cup. The team wearing the stripes this time are Spennymoor United, while former TAPIBAW stars Ashington have to settle for wearing their change strip of what the Chelsea marketing men once called jade. Honours were even with the game ending in a 1-1 draw witnessed by precisely 236 spectators, officially, with The Moors winning the replay. For Spenny to even be playing was a minor achievement, after being the subject of an FA ban which prevented them playing in the early weeks of the season while their complex off-field affairs were being sorted out. Now we normally try and vary the spread of countries featured in this spot, but after a chance conversation revealed that the roving lens of the Northern League Club website would be at St.James' Park on Saturday, we opted to remain in the North East of England once again. That's St.James' Park Alnwick of course, where the FA Vase paired the home side with our TAPIBAW veterans Ashington, fresh from a supporting role in the recent appearance of Spennymoor in this spot. Having been defeated by the Moors in their FA Cup replay, the Colliers had a rather better time of it on Saturday, as they defeated Alnwick 7-0. The home side are in the stripes, while Ashington once again don that rotten away kit. With only a slender one goal advantage after the home leg of their tie with Metalurg, Leeds were fighting for their UEFA Cup future in the Ukraine on Thursday. And being 0-1 behind at the interval was far from ideal for El Tel & Co. It's been a season of mixed fortunes for Metalurg, as they slipped to second from bottom of the Ukrainian league and parted company with their manager. They then recorded a 2-1 league win over the amazingly-named Polihraftekhnica Olexandria as a warm up to their UEFA Cup debut at Elland Road. 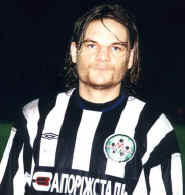 Pictured is 21 year old defender Vishevich Tomislav, who didn't feature against Leeds. 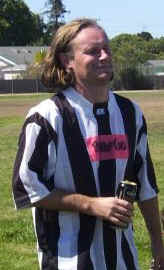 "I'm a toon fan living in sunny San Jose, California. 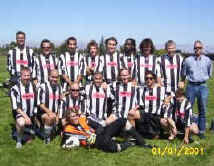 My team Mosquito's FC, a collection of beer boys from the San Jose Trials (English) pub) play in the famous black & white. "I managed to get a change in our strip a few seasons ago and have the added satisfaction of watching several Liverpool fans (mainly Irish) donning the toon top every weekend." "You'd make my wish come true if we could feature in TAPIBAW. PS - I'm the one with the Guinness...."